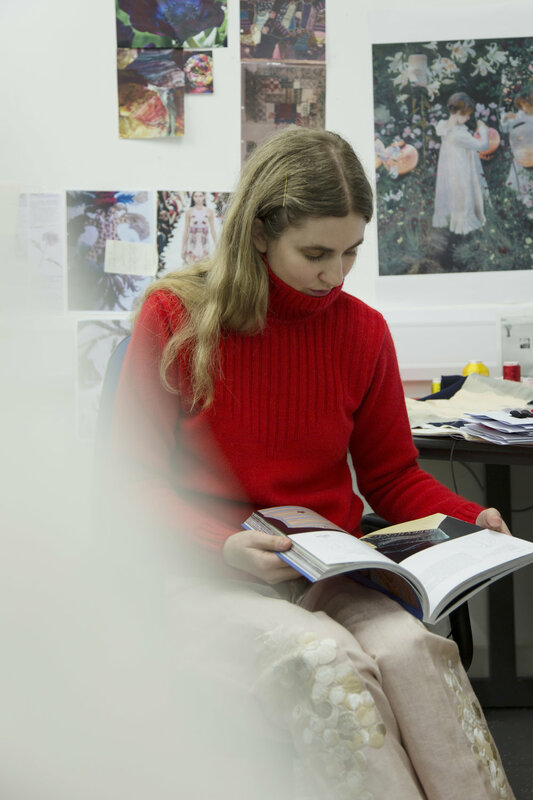 You have studied at CSM, Goldsmiths College of Art and completed an MA in textiles at the RCA - what was your experience of studying in London and did each college push you in a different way? I'm so happy to have studied in London. CSM's foundation art course made me feel free and it opened my mind. It was exciting to have moved to London and to go the private views every week. Goldsmiths made me ambitious and self-critical. I discovered my visual language. I became obsessed with nature, medieval tapestries and ecclesiastical embroideries. I also learnt hand and digital embroidery and was able to get a job as an embroiderer when I left. The RCA was a brilliantly positive place to study, overlooking beautiful Hyde Park. I learnt so much, felt that anything was possible and the embroidery ideas that I developed whilst there are still a huge part of my collections- in particular the technique of printing an image on top of textured embroideries. After graduating you moved to Antwerp and worked as an embroidery designer for Dries van Noten - did you know this was the direction you wanted to move in creatively. Tell us about your time there? My aim whilst studying my MA was to design embroidery for fashion. Dries is one of my favourite designers, his clothes have so much beauty and feeling. It was inspiring to work for a designer so focussed on embroidery and print. Whilst in Antwerp I learnt a lot about how to position embroidery on a garment and how to make embroideries rich but light weight, soft against the skin. I loved Antwerp too: the beautiful buildings, museums and organic food markets. During your studies you worked frequently for Tracey Emin, producing her hand-embroidered art works. How did this come about and what was the difference from working with a fashion house and an artist? I learnt hand embroidery at Goldsmiths and a friend of mine who worked for Tracey recommended me. I loved working there. Sitting on a giant bean bag in Tracey's beautiful and cosy studio we would work on huge canvases following Tracey's precise and spontaneous approach to embroidery. It felt different from working in fashion because we were focusing on one artwork at a time, artworks which were entirely one offs. In fashion there is more focus on the practicality of embroidery- is it dry cleanable, what is the costing per panel, does it feel nice against the skin. But both embroidery for art and fashion have to have feeling in them and be beautiful and mysterious. You started your own label in 2015. Did you always know you wanted to have your own line or was it an organic progression? It was my dream to have my own label but I didn't know how possible it would be financially. At the RCA I decided to make the best portfolio I could and to take every opportunity after I graduated. I sold my final RCA collection of 5 embroidered dresses to a client which made me feel that my work had commercial potential and fuelled my ambition to create pieces would be beautiful and sell. Whilst working for Dries I exhibited an embroidered boot that I made in collaboration with bespoke shoe designer Caroline Groves. Simon Burstein, who was then the CEO of Browns Fashion, saw this boot and liked the embroidery so much that he left his card. When I returned from Antwerp I met with him and Laura, who was the head womenswear buyer. He suggested I make a capsule collection 'Alice Archer for Browns'. He gave me a studio at the top of Browns on South Molton Street and we carried my extremely heavy digital embroidery machine up several flights of stairs. When Simon sold Browns to Farfetch he continued to support me, giving me a studio in his new shop The Place London and my label became ‘Alice Archer’. We now show on schedule at LFW and wholesale the collections to stores worldwide. Over the past two years you have gained a huge loyal following and stocked in some of the worlds most luxurious and prestigious stores. Do you enjoy the business side of running your own label alongside the marketing/ press etc. How big is your team? My focus is on the creative side, this is what I love best and Simon runs the business. We have a small team. I have two studio assistants, one of whom deals with production and the other helps operate the embroidery machine. We have freelance machinists, pattern cutters and press marketing and a sales team who take the collection to Paris to sell twice a year. The mood boards, ideas and workings in your studio are so inspiring. Describe the process from idea/ concept to final embroidered piece. I have a feeling or a mood that I want to explore for each collection. My biggest source of inspiration is nature, particularly flowers. For example for SS18 I wanted to explore fruit and the feeling of innocence in Singer Sargent’s work- not only in the atmosphere in his paintings but also in his brush strokes. I went to Sicily to stay on a lemon farm and paint lemons with oil paint. I then printed these paintings onto embroideries of lemons to create rich surfaces. Each collection starts with research. I want to find unusual visual research, and archives of unfamiliar illustrations of flowers. I often go to Kew Gardens library to look at ancient botanical illustrations of flowers for inspiration, and for SS17 which explored under the sea life I went to the Natural History Museum library to look at rare images of feathery corals and jellyfish. I find images that I want to interpret into embroidery and I experiment with colour and texture on embroidery machine. I research shapes and sketch embroidery placements and go to Premiere Vision twice a year to pick fabrics. We toile and position embroideries in the studio by pinning image print outs onto the toiles. Then we make prototypes which we fit on my assistant Diana, who is not only brilliant at embroidery but a perfect fitting model. She also models in all my presentations. Your pieces are so intricate what is the most difficult part of producing a style? There are so many challenges in making the different styles in the collection. One thing I’ve had to learn is to find appropriate fabrics for the different embroideries- sometimes the embroidery is too heavy for the base fabric and the garment doesn’t hang as it should. I am learning more and more how to balance the weight of the embroidery with the base cloth. Timing also can be a problem- it takes me such a long time to programme all the embroideries. I’m obsessed with detail and want the pieces to feel hand embroidered so I programme every single stitch and some of my pieces have 500,000 stitches! Preparing a collection means lots of sleepless nights! Youre getting married in April next year and are designing your own wedding dress - can you tell us any more?! It feels so special to make a wedding dress. I have previously embroidered dresses for the weddings of two of my best friends. In each of my previous collections there have been pieces, particularly tulle dresses, that lend themselves to being wedding dresses. I'm excited to push these shapes and embroideries further and develop an ethereal, romantic but structured dress for my wedding. At the moment I'm in the process of researching my favourite spring flowers that I will embroider on to the dress. What is your vision for the brand? In 5 years time where would you like to be? I’m very ambitious for my brand and would like the business to grow slowly and securely. I want the clothes to stay special, to continue to put lots of love into making them and for the focus to remain on embroidery and print. I would like to have more stockists and to move from doing presentations during LFW to catwalk shows. I would like to make a dress for the Met Ball! Which piece from the Blake LDN collection do you love and why? I adore the Redfern jumper- it’s such an amazing vibrant colour and so soft and luxurious to wear- I think it goes beautifully with some of my embroidered skirts and trousers. Photos by Thea Lovstad. Words by Alice Byrom. We shot Alice at her studio wearing the REDFERN Chunky in navy and red and the PHILIPPA in navy. Both available online now.